The following article by Rabbi Raymond Apple appeared in the Jerusalem Post on 14 June, 2015. One of the amazing experiences of life in Jerusalem is how every day – and any day – is both yesterday and today. The street names recall ages as disparate as those of King David and King George. The buildings are a jumble of the Bible, the Koran, the 19th century European Christian missionaries and the Champs Elysees. The people are both mystics and moderns, sometimes rolled into one. There are believers who move sedately, lost in meditation; pietists who constantly scurry in search of a chance to study or to pray; old women who lug their heavy shopping trolleys; students with backpacks on the way to a lecture; youngsters in skimpy dress who meet their friends in an underground disco or bar. All believe that Jerusalem belongs to them. Jerusalem is an elevated site, where life is always on a high. There are highrise apartments – and lowly caves. There are stairs too, and walls. Parts of the city have the feel of Wall Street – but the wall par excellence is the Kotel Ma’aravi, the Temple’s Western Wall that has survived the depredations of generations of the city’s conquerors. It is customary to place a folded scrap of paper in the Wall’s crevices. Popes and presidents, politicians, priests and poets; athletes, actors and artists; people of all creeds, colors and cultures – all leave their prayers here. Ordinary Jerusalemites flock here on high days, holy days, weekdays or whenever, never leaving the Wall unattended even in the depths of the night. There are debates about egalitarian prayer, but those who seem to live at the Wall take no notice. 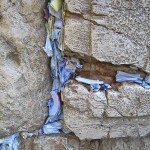 The little scraps of paper that people leave in the Wall’s cracks are called k’vitlach or tzettlach in Yiddish, in Hebrew pitka’ot. They are not so much written with ink as with tears. God reads them all. It doesn’t matter if once in a while the notes are collected and given reverent burial. The message has already been heeded; whatever the answer, the person whose heart was poured into the petition already feels better. What the messages are about is health, happiness, serenity, success, good marriages, good children and family stability. World peace certainly figures. If we ask how the k’vitlach custom arose, nobody is certain. In the 18th century Rabbi Chayim ibn Attar of Morocco, author of the Or HaChayyim, who died in 1743, learned that a disciple, Chayyim Yosef David Azulai, the Chida, was planning to live in Israel, and he asked him to put a letter in the stones of the Wall. Azulai agreed, but it slipped his memory. When eventually he remembered, he went to the Wall and left the note there. Someone extricated the note and read it. It was a plea to God to grant success to Azulai, whom it called a great scholar. This alerted the sages of Jerusalem to the qualities of Azulai and they appointed him as their head. There are many other tales about the life of Azulai. Who knows which ones are embroidery or embellishments? Another version (recorded in Sha’ul Schaffer’s Israel’s Temple Mount, 1975, p. 163) says that when Rabbi Attar gave a note to a poor man who needed help, the recipient meant to place it in a crack of the wall but the wind blew it away and someone read it and was able to arrange support for him. So three centuries ago it was already considered efficacious to put notes in the wall. 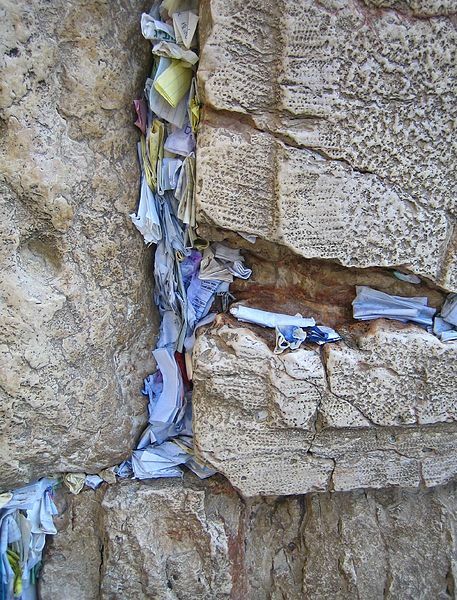 The notes in the wall express the outpourings of innumerable hearts and acknowledge the tradition that the Divine Presence never left the sacred site of the Holy Temple. The prayers in the crevices all ask for Divine support and intervention. Asking God to do what we can do for ourselves actually diminishes God, who implanted in His creatures so many energies that they should use before seeking Divine miracles. Personally, I don’t usually place notes in the Wall. I seek a quiet corner where I can think about my life and priorities: what I could only achieve if I used the abilities God gave me! Someone told my wife I was famous. Whether it’s true or not, I place no store in fame. I prefer to do ze’er sham, ze’er sham – “a little here, a little there” (Isaiah. 28:10) – among human beings. What you pray for is a reflection of who you are. If you want to put a note in the Wall, fine. But don’t leave everything to God. To ask Him to do all the work is to abdicate. As Rav Kook says, it also diminishes the One who created so much talent in each of His creatures. At the same time, don’t try to do it all yourself and leave nothing to Him. That’s just arrogance. Ask for His help. More importantly, imprint your dreams not so much in but on the walls of wherever you are. We can all affect our microcosms, starting at home. Let’s try civility, cleanliness, decency, ecology, generosity, helpfulness, honesty, hospitality, justice, literacy, safety, thrift, and human tolerance above all. This is an edited version of a talk given to a delegation of Australian Freemasons. This entry is filed under Articles, Israel, Other.